WASHINGTON - The U.S. is preparing to expand sanctions against Venezuela by freezing assets of 10 to 20 additional people tied to the government of President Nicolas Maduro, according to two people familiar with the matter. 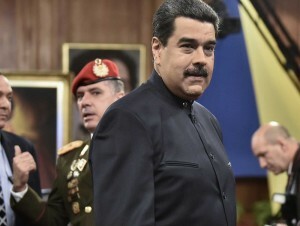 The action could come as soon as Tuesday, though it may be delayed as the Trump administration seeks a coordinated international response in imposing penalties on the Maduro regime for undermining democracy in the South American country, the people said. The U.S. is pressing to enlist European and South American countries -- including neighboring Colombia -- to match the sanctions and may hold off taking unilateral action if necessary for a coordinated announcement. The people spoke on condition of anonymity to discuss the step before its formal declaration. At least 11 Latin American countries as well as Canada are meeting in Lima on Tuesday to discuss the implications of Venezuela’s newly convened assembly charged with rewriting the constitution. Peru’s President Pedro Pablo Kuczynski has led calls for a regional response to the deteriorating economic and humanitarian situation. A press conference to present the conclusions of the meeting is scheduled for 2:30 p.m. New York time. The additional sanctions would increase pressure on Maduro as he tries consolidate power and pursue political enemies. The Trump administration took the unusual step of personally sanctioning a head of state when it froze any of Maduro’s assets in the U.S. on July 31 after he proceeded with a vote on a new assembly that was a first step to revising the constitution. The U.S. previously sanctioned 13 people associated with the regime, including Simon Zerpa, vice president of finance at Petroleos de Venezuela, the state oil company. A Treasury Department spokesman declined to comment. The planned sanctions stop short of a more significant penalty that has been under consideration: banning imports of Venezuelan oil, which accounts for 95 percent of the country’s foreign-currency earnings. Venezuela, a founding member of OPEC, has the world’s largest proven reserves and is South America’s largest oil exporter. It also is the third-largest source of imported oil to the U.S. The deepening political crisis and the threat of additional sanctions has worsened Venezuela’s economic turmoil. Repsol SA pulled all foreign workers from its oil fields in Venezuela, while Chevron Corp. and Total SA have removed a small number of employees, according to people with knowledge of the companies. Norway’s Statoil ASA has withdrawn its expatriate staff. Maduro triggered the latest round of U.S. pressure by installing a constituent assembly charged with rewriting the constitution. The vote to elect the assembly was boycotted by the opposition, which controls the elected legislature, and marred by accusations of fraud. The assembly on Saturday removed the chief prosecutor Luisa Ortega Diaz, a critic of Maduro’s regime, and vowed to rule for a maximum of two years. As protests by the opposition continue, Maduro on Sunday said a group of “mercenaries” attacked a military base in the central city of Valencia but had been defeated. At least seven people were detained and two were killed among a group of 20 who staged the assault, according to the government. While the incident couldn’t independently be confirm, videos taken from nearby apartment buildings and circulated on social media showed armored cars driving near the entrance of the base as smoke lifted in the distance, with sounds of possible gunshots. A separate video showed a group of soldiers led by a captain identified as Juan Carlos Caguaripano, declaring themselves in rebellion.